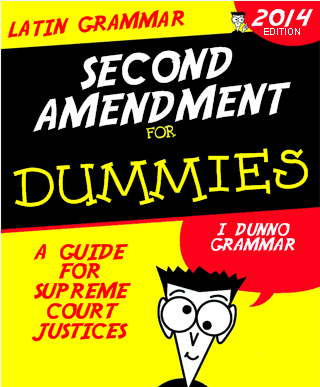 Every legal scholar knows that from 1776 until 1986, our Supreme Court did not once question the meaning of the Second Amendment. Nor, for that matter, had any federal court. Said simply, until the advent of the NRA’s vigorous campaign funded by none other than the $12 billion per year gun industry, nobody questioned the framers intent, an intent clearly delineated with punctuation as bold as a red highlighter on an elementary school report. In United States v. Miller (1939), the Court ruled a sawed off shotgun was not protected by the Second Amendment because it had ‘no reasonable relation to the preservation or efficiency of a well regulated Militia.’ This holding went undisturbed until 2008 when the 5-4 split in District of Columbia v. Heller held unconstitutional a ban on handguns (in a city with the highest homicide rate in the U.S.). Former Chief Justice Warren Burger (appointed by Nixon) has referred to the NRA’s obfuscation of the Second Amendment as ‘the greatest piece of fraud, I repeat the word ‘fraud,’ on the American public by special interest groups that I have ever seen in my lifetime.’ And that’s coming from a Republican. The NRA falsely touts itself as a protector of Constitutional rights but in reality is nothing but a proxy for gun manufacturers, with two of its biggest donors being Italian gun manufacturers Beretta and Benelli (meaning they have no legitimate interest in individual civil liberties of Americans). It is odious to see substance of the U.S. Constitution tarnished with beguiling special interests who care nothing about the Bill of Rights and everything about revenue. The framers intent was never to enshrine a right for corporate profit nor was it the framers intent to have ‘activist’ judges intentionally disregard their grammatical perfection in order to legislate from the bench. If Justice Scalia wants to claim to be a textualist, he needs a refresher on the ablative absolute.